Atlanta Region SCCA’s March National was the first SCCA event in the 40th Anniversary year of Road Atlanta. The weekend started out with great weather on Saturday, but we didn’t get quite as lucky on Sunday. It was wet all day on Sunday. Nevertheless, it was a great first weekend at the track for me. This was my first event of 2010. There were 5 National races and 2 Pro-IT races this weekend. Gallery of Images from this event. Tom Fowler and crew making final checks on one of the 7 cars fielded by OPM Motorsports this weekend. The last session of the day on Saturday was the first race of the weekend, and the first of 2 Pro-IT races. Matt Reppert takes poll position and wins the race overall, and sets fastest lap in the process. Mark Pombo wins in ISM and Andrew Charbonneau finished second, but was penalized to last in class for being underweight. Michael Vitarelli finishes 2nd in ITX but has a wild ride along the way. Group 2 was the first race on Sunday before the mandatory quiet time at Road Atlanta. John Robinson II came from 7th on the grid to win overall, and set the fastest lap time. Keith Roberts had pole position but spins at Turn 7 after contact with Chuck Moran. Roberts’ day didn’t get any better as he was penalized to last place in class due to wing width. Group 3 was a split start with the Production cars taking the green flag first, and then the SRF cars. Sam Moore had pole position in his #17 BMW Z3, but spun exiting Turn 12 at the start. Jean-Luc Liverato also spun on lap 1 at Turn 3 in the #8 SRF car. Franklin Futrelle started 8th overall and finished the race in 1st overall. Randy Carter led in EP, but lost the lead with a spin in Turn 5, and Sam Moore recovered from his first lap spin to take the EP win. the field after his first lap spin. Group 4 was also a split start with SSB, SSC, T2, and T3 taking the green first, followed by the Spec Miatas. Marty Grand, 2nd on the grid, grabbed the lead by Turn 1 on the start and led all the way to the checkered flag. Don Istook wins in T3 regardless of a spin earlier in the race at Turn 11. Danny Steyn took the lead on the first lap from 7th position of the Spec Miata grid and was never really challenged throughout the race. The battle for 2nd throughout the race included Cliff Brown, Mark and Matthew Pombo, Voytek Burdzy, and Alex Bolanos; with Burdzy taking it on the last lap ahead of Bolanos. Spec Miata always provides for close, exciting racing as this series of pictures shows. Matthew Pombo attempts an outside pass on Alex Bolanos at Turn 7. The rain really started to come down for the last 3 races of the day. Group 5 was interesting just seeing the water spray coming from the open wheel cars. I believe poor visibility was the cause of what I hear was the most spectacular incident of the weekend. Keith Grant and Jacek Mucha came together on the back straight between 9 and 10a. I don’t have all the facts on this incident, so if anyone reading knows more about it please comment at the end of this post. I heard that Mucha got airborne and went into the wall with the top of the car. Both drivers were ok, but both cars were taken back to the paddock on multiple trucks. The race was stopped and the results show only 16 laps completed. Both Grant and Mucha still took their class wins as the results reverted to the previous lap before the race was stopped. Group 5 had the most attrition of the weekend with 6 cars classified as DNF’s. Fletcher Williams getting some much needed beauty sleep on the grid. The Group 6 race was black flagged for approximately 25 minutes after an incident at the start involving Russ Snow, Richard Grant, and Jerry Onks on the front straight. Grant and Onks were not able to continue. I don’t know anymore details, so if anyone has more information please comment at the end of the post. Snow was able to continue and finished 3rd in STO and 7th overall. Andrew Hauck started from the grid in 6th place, worked his way to the front, and took the lead on the penultimate lap. He held on for the overall win with a 3.077 second margin of victory over Marty Grand, who was the STO winner. Jeff Dernehl led overall for 7 laps, but finished 3rd overall taking the GT3 win. The rain was really heavy for the last race of the weekend. Danny Steyn had pole position and led the first 11 laps. Tom Lyttle started 11th and had the overall lead by lap 12 and went on to win ITS and overall. Steyn took the ISM win. 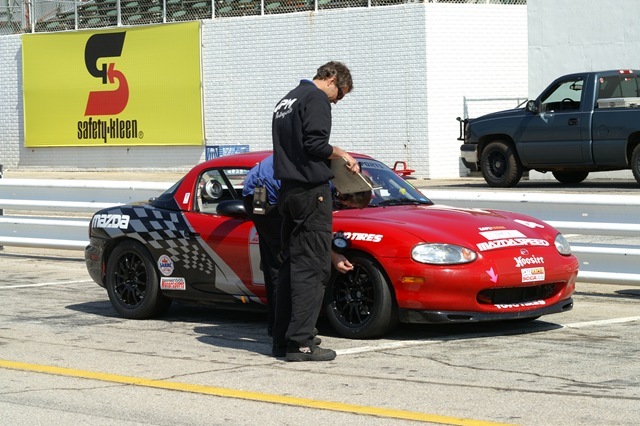 This weekend was only Danny Steyn’s 2nd race weekend in his new OPM Motorsports Miata and he went home with an overall and a class win. how to put you in touch. Just reply to this email, and we’ll go from there. Looking for Jay Puskinalis ??? ?Can you help me out.I know he was a member several years ago…would have been either Safety /Race medical. Dang Clark is right in the mark with these pics and its so cool the way he has added the corner workers in there to show the behind the scenes not everyone knows that we are a big part of this racing andwhat goes on on the track that we take care of so that these drivers can be safe they know they can counts on us to be there. Clark has made his voice loud for us and I for just 1 of many would like to say THANK YOU Clark for realizing we are out there to you go guy. The pics are awesome and you catch alot of what we do in these pics. The racing is as awesome as dangerous to the drivers and workers and Clark had enough guts to just show and tell it like it is and I thank him for that. We have dang good workers and drivers out there and its about time someone sees that.